This breed of oriental saddle horses was formed in Kazakh, Akstafa and Tauz regions of Azerbaijan and adjacent areas of Georgia and Armenia. Some earlier publications described it as the "Kazakh" horse of Azerbaijan or as the Azerbaijan horse. 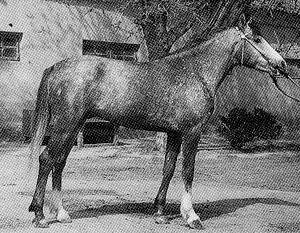 Specialists singled out a specific Deliboz type among large horse populations studied in the 1930s and late 1940s. Those horses were improved by Arabian and Karabakh saddle-type stallions. Deliboz horses spread widely throughout western Azerbaijan. In 1943 a State Breeding Cooperative was established to improve horse populations of the Republic. 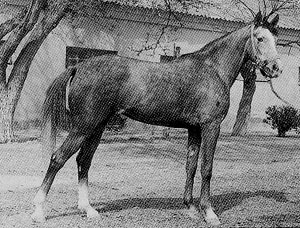 Since the 1950s Azerbaijan horses have been improved by Arabian and Tersk sires while Karabakh was bred separately. Crossbreeding involved horses of the Deliboz type. Deliboz horses differ from others by a clean, short head with a broad forehead and narrow nose, a compact heavy neck, a ribbed massive body with a good top line and an even, long back and loin. Legs are clean and well proportioned and the cannon bone girth is larger than that of other horses. Deliboz is characterized by unstable temperament and predominantly rack (or pace) gait. A typical feature is a peculiar lengthwise fold on the tongue giving the impression of a forked tongue. Average withers height is 152 cm, chest girth 172 cm and cannon bone girth 19.4 cm. The Deliboz horses show good working capacity. They easily cover 45-55 km a day in highlands under a pack weighing 115-130 kg, and 70 km under a rider. The best racing results are 1 min 56 sec for 1600 m and 2 min 55 sec for 2400 m.
At present the pedigree nucleus of Deliboz is represented by descendants of Tersk stallions Tselostat and Pygmalion; therefore the problem arises of how to restore the breeding nucleus of local horses. Dashyuz stud farm has the 140 most typical Deliboz horses including breeding mares with a high proportion of Tersk blood. It is planned to breed them pure but with single back crossing to one or two stallions with little Tersk blood in order to preserve the valuable traits of the crosses. We are currently searching for photographs, slides or video of this breed. If you have visual material which we could borrow or if you know of a potential source please contact us using the comment form below.